The Dragon and the Scholar series is comprised of four fantasy books about the adventures of a scholar who’s fallen in love with a dragon. Book 1 starts out with scholar Shannon sent to the kingdom of Regone to heal a young king with a serious attitude problem. Turns out he was injured fighting dragons after one ate his brother. When a dragon shows up near the castle, Shannon takes it upon herself to convince him to leave without bloodshed, but instead she ends up enjoying his company. Without any spoilers, the rest of the series is about her relationship with Gnaw, as the dragon calls himself. The two are obviously in love, but Gnaw is a pragmatist – how could Shannon possibly be happy with him – and keeps pushing her away. Shannon tries to hold out hope that they’ll get a happy ending, but Burke throws a nice mix of obstacles in their way, from other princes to vengeful wizards and even a power-bent Fey queen from the past. 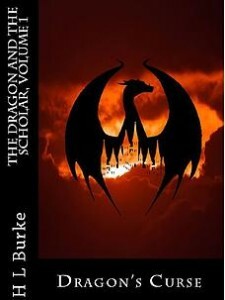 Overall, The Dragon and the Scholar series is a quick read with likable characters and fun plots. For the music, I think Evanescence’s “Bring Me to Life” is fitting for the whole series, as the overarching plot concerns how Shannon can save Gnaw – both from his dragon nature and his own thoughts. Thanks for the feature and the link to the awesome video.